Shawna is a gorgeous girl that was spoken for before she actually got to us. She just arrived and is at the vets now and will be going straight to her new home. Congratulations to the Gibbs family of Inman! 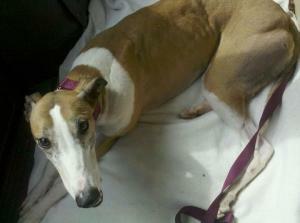 Shawna is a red girl with lots of white that is friendly and sweet. She is small and raced at 57lbs. Her birthday is April 4 2009.